One request that I’ve started to see more and more of is for easy dinner ideas. It’s understandable. I could use some more easy dinner ideas, especially easy dinner ideas that are healthy! This recipe will make all of us happy. 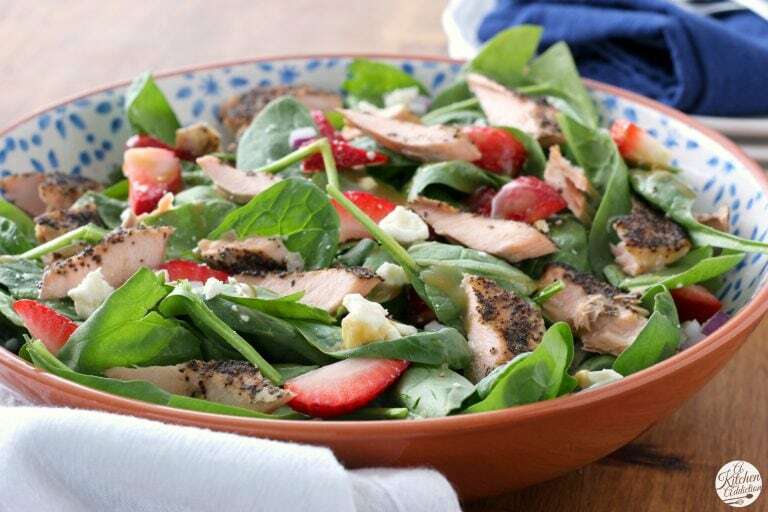 It really doesn’t get much easier than this baked salmon strawberry spinach salad (complete with a honey dijon vinaigrette!)! You can have dinner on the table in 25 minutes. It’s also pretty hands off. While the salmon is baking, you can toss together the salad and quick whisk together the vinaigrette. That’s it. Though I did get some help from Bumble Bee SuperFresh®. Have you seen their new seafood products? They are all-natural and have great flavor. They also lack that “fishy” smell that comes along with a lot of frozen seafood, because you can prepare their products straight from the freezer. Their frozen protein has stayed that way from harvest to your oven unlike most of the “fresh” fish you find at the seafood counter. That means it is fresh tasting, and fresh smelling. I used the Bumble Bee SuperFresh® Salmon with Garlicky Black Pepper & Extra Virgin Olive Oil for this salad, and it was the perfect pairing to the sweet strawberries and honey dijon vinaigrette. It was also super easy to prepare. Just stick the fillets into their included parchment, and let your oven do the rest. It’s so easy you could make it for a quick weekday lunch! Other Bumble Bee SuperFresh® products would work with this salad, too, if you want to give the other flavors a try! 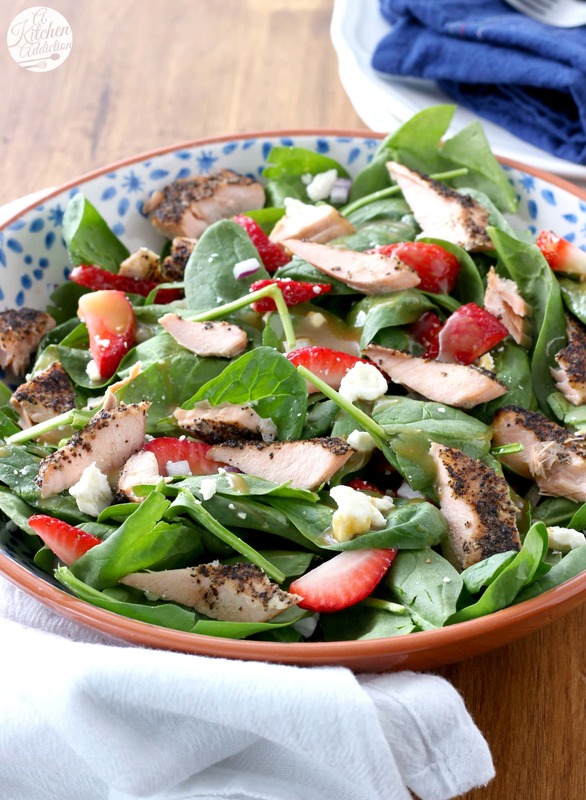 The salad is made up of fresh baby spinach, sweet strawberries, and salty feta. And because it’s so easy, a homemade vinaigrette ties together all of the flavors! This honey dijon vinaigrette has a splash of balsamic vinegar and has become a new favorite around here, not only for this salad, but also for all the other salads we’ve been eating lately! Lots of flavor without lots of work. This recipe is a keeper. 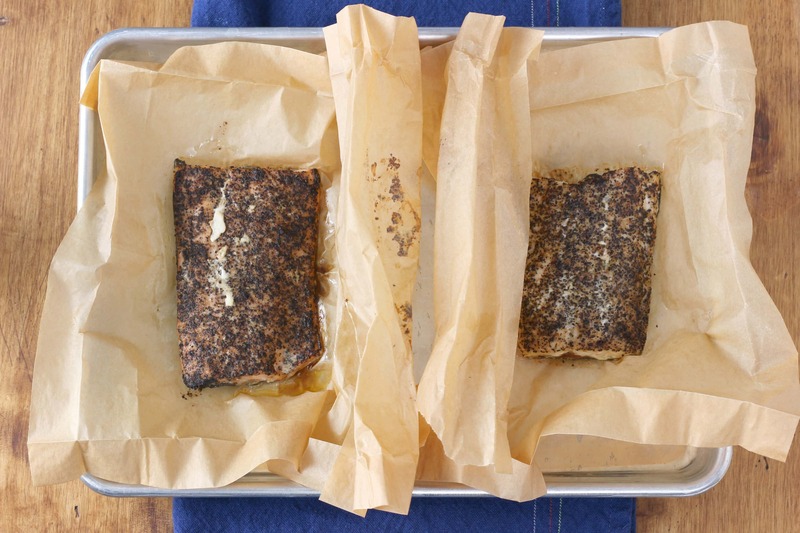 Remove salmon from packaging and put each fillet into its provided parchment packet and fold to enclose. Place packets on a baking sheet and bake for 22 minutes. While salmon is baking, prepare salad. In a serving bowl, toss together spinach, strawberries, feta, and red onion. Set aside. In a small bowl, whisk together dijon mustard, honey, olive oil, and balsamic vinegar. Drizzle over salad. Remove baked salmon from oven. Take fillets out of parchment packets, flake into pieces, and place on salad. Serve. What a pretty salad! Strawberry spinach ones re my favorite, so I love that you jazzed it up with salmon. 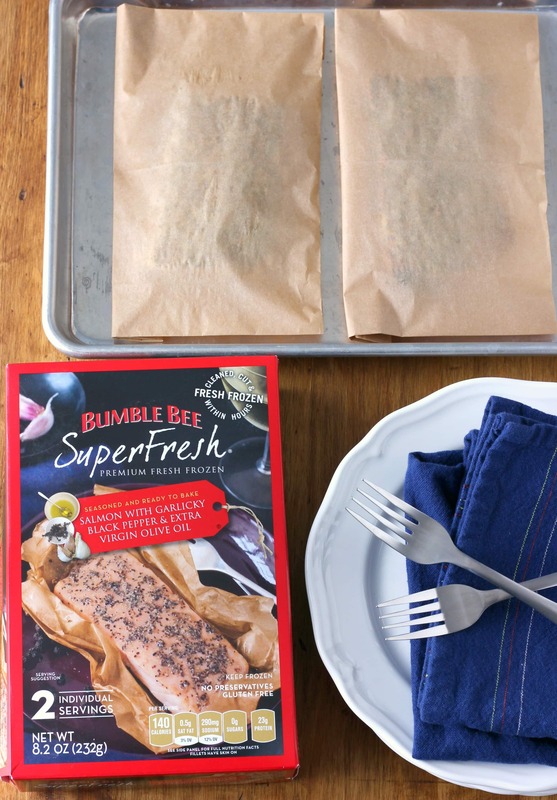 Bumble Bee seafood is a favorite of mine, so this looks like a meal time winner! Strawberries and salad? Genius! I’d love this. I love this combination of flavors! I’ll have to check out these packets for a quick lunch! This salad is gorgeous! I am loving the sweet addition of the strawberries! I haven’t tried Buble bee salmon yet and looking at this salad, I so need to! Such a colorful and delightful blend of flavors in this! I know I’m late to the game, but I am just getting used to fruit in my “salad”. But I will say strawberries will do it to me each and every time! Ahhh salmon is my new found love! Love that these come ready to go straight out of the freezer. Totally need to find some next time I’m shopping! I love spinach salads so much- love the strawberries! 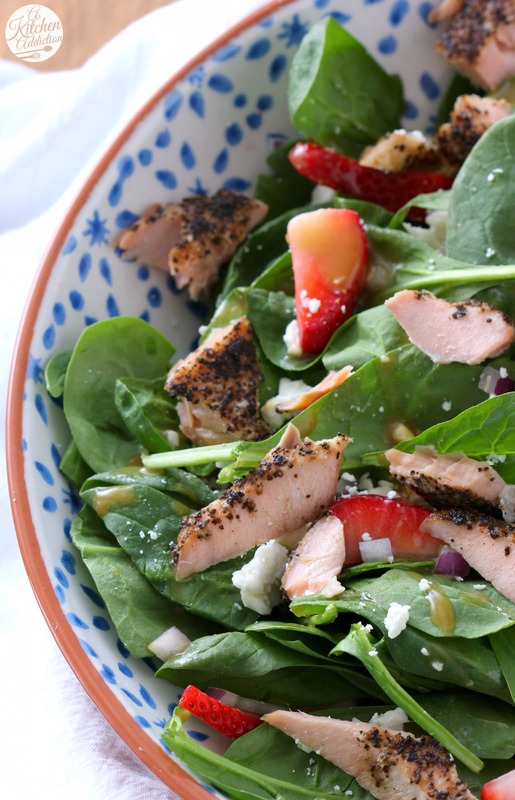 I love adding strawberries to my salads, and I love that you made this a heartier meal with the salmon! These are such great flavors! 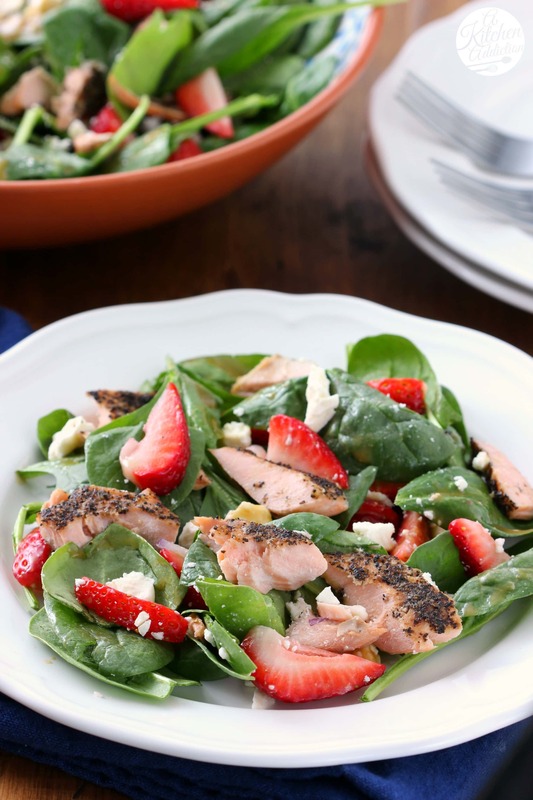 Strawberries and salmon is one of my favorite combinations for a spring salad! And the honey-dijon vinaigrette sounds like the perfect dressing for it! I love how simple this salmon is! Salmon is something we don’t have often in the winter, but seafood is so perfectly light and fresh for the spring and summer! Yay for strawberries!! This salad looks so fresh and light and perfect for this time of the year! I love adding strawberries in my salad! Yum! This salad is so so pretty! Love the strawberries and baked salmon! Perfect for busy weeknights! I could live off this salad!!! What a beautiful and delicious combination!! !